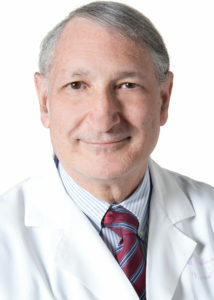 Bruce Cohen, MD, ’84 GME, chief of Multiple Sclerosis and Neuroimmunology in the Department of Neurology, was a co-author of the study published in the New England Journal of Medicine. An oral therapy called ibudilast significantly reduced the rate of brain tissue loss in patients with progressive multiple sclerosis (MS), according to the results of a recent phase II trial. The findings, published in the New England Journal of Medicine, support further study of the drug to determine if they might also translate to a clinical benefit in patients. “While many treatments have been developed for relapsing forms of multiple sclerosis, progressive MS has proved more difficult to treat. If this medicine proves effective in further studies, it would be an important addition to our current therapies,” said Bruce Cohen, MD, ’84 GME, chief of Multiple Sclerosis and Neuroimmunology in the Ken & Ruth Davee Department of Neurology, and a co-author of the multi-site trial. MS is a chronic disease of the brain and spinal cord in which the immune system attacks myelin, the substance that protects nerve cells. This damage disrupts communication within the central nervous system, leading to potentially disabling symptoms such as muscle weakness, vision loss and difficulty with coordination. MS, which has no cure, is typically categorized into either relapsing forms — characterized by isolated flare-ups of symptoms — or progressive forms, where symptoms worsen over time. Although there are more than a dozen therapies available for relapsing forms of MS, treatment options for progressive MS are much more limited. Previous research had suggested that ibudilast — an oral therapy used in Asia to treat asthma and post-stroke vertigo — may provide a neuroprotective benefit in patients with progressive MS. In the current trial, investigators evaluated the safety and efficacy of ibudilast in 255 patients with primary or secondary progressive multiple sclerosis. Half were randomized to receive ibudilast, while the other half received a placebo. The investigators found that over nearly two years, ibudilast reduced the rate of brain atrophy in patients taking the active drug by 48 percent compared to those taking a placebo. Gastrointestinal symptoms were found to be the most common side effects of ibudilast, and the drug was also associated with higher rates of headache and depression. The study was supported by grants from the National Institute of Neurological Disorders and Stroke (NINDS) (U01NS082329) and the National Multiple Sclerosis Society (RG 4778-A-6) and by MediciNova through a contract with the National Institutes of Health (NIH). The NeuroNEXT Network is supported by the NINDS (Central Coordinating Center, U01NS077179; Data Coordinating Center, U01NS077352; and individual grants to each trial site). Research reported in this study was also supported by grants from the National Center for Advancing Translational Sciences of the NIH to Case Western Reserve University (UL1 TR000439), Columbia University Medical Center (UL1 TR 000040), Montefiore Medical Center (UL1 TR002556), Oregon Health and Science University (UL1TR0002369), University of Cincinnati (UL1 TR001425-03), University of Colorado Denver (KL2 TR001080), Washington University in St. Louis (UL1 TR000448) and Weill Cornell Medical Center (UL1 TR000457).